The JPS TANAKH: The Jewish Bible, audio version, is a recorded version of the JPS TANAKH, the most widely read English translation of the Hebrew, or Jewish, Bible. Produced and recorded for The Jewish Publication Society (JPS) by The Jewish Braille Institute (JBI), this complete, unabridged audio version of the Book of Micah features 20 minutes of readings. The JPS TANAKH: The Jewish Bible, audio version, is a recorded version of the JPS TANAKH, the most widely read English translation of the Hebrew, or Jewish, Bible. Produced and recorded for The Jewish Publication Society (JPS) by The Jewish Braille Institute (JBI), this complete, unabridged audio version of the Book of Amos features over 20 minutes of readings. 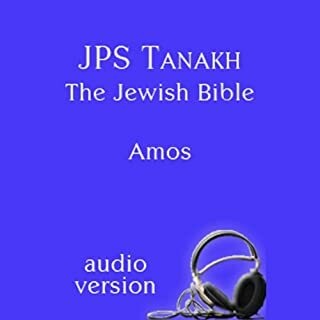 The JPS TANAKH: The Jewish Bible, audio version, is a recorded version of the JPS TANAKH, the most widely read English translation of the Hebrew, or Jewish, Bible. Produced and recorded for The Jewish Publication Society (JPS) by The Jewish Braille Institute (JBI), this complete, unabridged audio version of the Book of Habakkuk features approximately 10 minutes of readings. The JPS TANAKH: The Jewish Bible, audio version, is a recorded version of the JPS TANAKH, the most widely read English translation of the Hebrew, or Jewish, Bible. Produced and recorded for The Jewish Publication Society (JPS) by The Jewish Braille Institute (JBI), this complete, unabridged audio version of the Book of Zephaniah features 10 minutes of readings. The JPS TANAKH: The Jewish Bible, audio version, is a recorded version of the JPS TANAKH, the most widely read English translation of the Hebrew, or Jewish, Bible. Produced and recorded for The Jewish Publication Society (JPS) by The Jewish Braille Institute (JBI), this complete, unabridged audio version of the Book of Haggai features approximately seven minutes of readings. The Jewish Bible, audio version, is a recorded version of the JPS Tanakh, the most widely read English translation of the Hebrew, or Jewish, Bible. Produced and recorded for The Jewish Publication Society (JPS) by The Jewish Braille Institute (JBI), this complete, unabridged audio version of the Book of Obadiah features four minutes of readings. The Jewish Bible, audio version, is a recorded version of the JPS Tanakh, the most widely read English translation of the Hebrew, or Jewish, Bible. Produced and recorded for The Jewish Publication Society (JPS) by The Jewish Braille Institute (JBI), this complete, unabridged audio version of the Book of Joel features over 12 minutes of readings. The Jewish Bible, audio version, is a recorded version of the JPS TANAKH, the most widely read English translation of the Hebrew, or Jewish, Bible. Produced and recorded for The Jewish Publication Society (JPS) by The Jewish Braille Institute (JBI), this complete, unabridged audio version of the Book of Hosea features over 30 minutes of readings.